I don’t think it’s unfair to say the Jaime Garcia Reserva Especial line is overshadowed by the eponymous My Father lines, much like tobacco patriarch Don José “Pepin” Garcia overshadows the talents his son, Jaime. But my experience smoking four of the Jaime Garcia Reserva Especial TAA 2017 cigars serves as a reminder that Jaime Garcia’s talents aren’t to be overlooked. 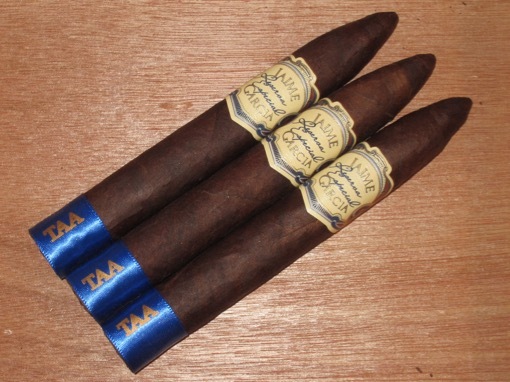 Like the entire Jaime Garcia Reserva Especial line, the $9.50 TAA edition (6.125 x 52) features a dark, oily Broadleaf wrapper around Nicaraguan binder and filler tobaccos. The exact differences between the TAA edition and the regular sizes aren’t disclosed, but reports are the TAA blend is tweaked and the 2017 version uses tobaccos that are extra aged (compared to the 2011 TAA). A savory oak flavor dominates the cigar, which also features an abundance of unsweetened chocolate and black coffee. Other flavors include a subtle syrupy sweetness and pepper that particularly comes through on the retrohale. Construction on each of the cigars was flawless. The box-pressed torpedo shape concentrates the flavors nicely on the palate. The taste is largely consistent from start to finish, but the chocolate and pepper both build towards the final third as the profile ramps up from medium-bodied to medium- to full-bodied. The Jaime Garcia Reserva Especial TAA 2017 is a classic Broadleaf maduro smoke. It is rich and balanced with equal parts subtle sweetness and spice. This cigar makes me want to revisit the regular offerings in the Jamie Garcia Reserva Especial line. It earns a rating of four stogies out of five. Correct me if I’m wrong but didnt Jamie start my father cigars? And how does Don pepin overshadow his son? When I think of the cigars coming from their factory I immediately think of Jamie Garcia. But anyways good review and I appreciate what you do.